Sculptra is a naturally biodegradable product that has been used by specialist aestheticians for many years. It is a different type of injectable treatment that was originally developed to correct facial volume loss associated with AIDS. Patients with this condition suffer from severe connective tissue loss around their cheek and chin area. Sculptra works to provide a long-term solution to this particular problem, by ‘seeding’ the collagen forming cells that reside in the cheeks and inducing them to produce greater quantities of collagen/elastin. 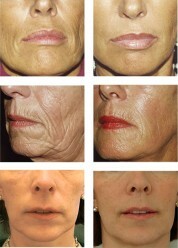 The newly created collagen works to enhance the volume of the cheek and smile-line area. The main active ingredient in Sculptra is a substance called Poly-L-Lactic Acid or PLLA. This is a collagen promoting product that activates dormant (sleeping) fibroblasts and begins the process of new collagen formation. Fibroblasts are cells that live within the skin, and are involved in the synthesis of collagen and extracellular matrix (the structure that holds the skin together). There is a marked improvement in cheek and facial volume after 3 treatments with Sculptra whilst maintaining a natural finish. Fibroblasts are essential to the youthful appearance of skin and connective tissue and as such activated fibroblasts play a pivotal role in maintaining and enhancing the factors that we associate with young skin – namely consistency, elasticity and smoothness. Sculptra, once absorbed by the skin matrix and the fibroblasts, works slowly to regenerate the connective tissue. Once the desired effect has been achieved, the average length of duration is around 2-3 years. The initial treatment costs £450 and each treatment session there-after will cost £400. To achieve a good result a minimum of two sessions will be required at least 6 weeks apart. Many clients choose to have 3 – 4 sessions of treatment spread over 12 months, for optimal effect. As with any treatment you will need to have a thorough consultation to decide if this treatment is right for you. However, unlike other botox and filler treatments it is not possible to have the Sculptra treatment at the same appointment as the consultation, as it must mixed at least 4 hours prior to administration.